The OutputDrops EEM applet which relies on the output_packets_dropped variable detected the flood within 10 seconds. really good one. This will reduce the operation cost. 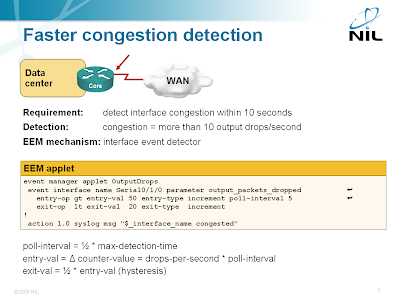 Can this technique be adapted/extended to detect and alert on drops on a per-QoS class basis? I'm investigating ways to generate a trap when drops within specific traffic classes reach specified thresholds. * The MIB variables are updated only once every 10 seconds.